two Halloween pumpkins head jack lantern with burning candles over black background. Halloween holidays art design, celebration. Stock video footage HD 1080p. hd00:13Halloween Pumpkin head lantern with burning candles on a black background on wooden table with knife and spoon. Celebration of the holiday of Halloween, celebration. 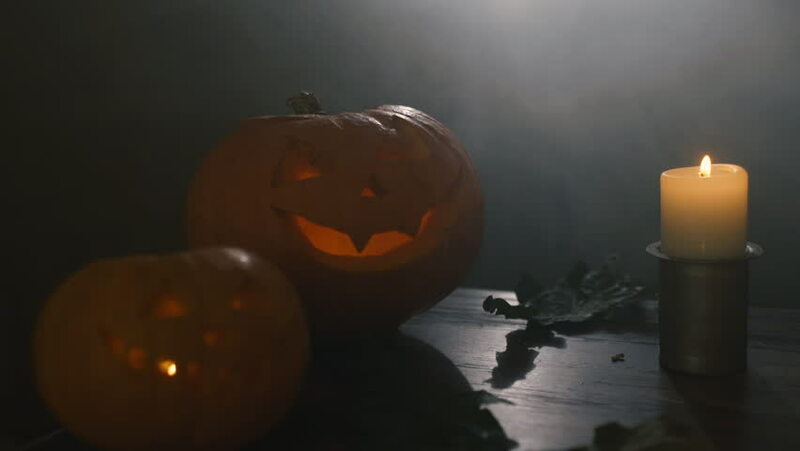 4k00:24three Halloween Pumpkins head lantern with burning candles on a black background on wooden table with knife and spoon. Celebration of the holiday of Halloween, celebration. top view. hd00:20All Saints' Day,Halloween.Pumpkin with evil face,teeth in shape saw lies on mirror,inside pumpkin and around burning candles.Reflection pumpkin and candles in mirror.Wind blowing,fire flickering.